On 17-4-96, 1500 peasants occupied Highway PA-150 near the hamlet of Eldorado dos Carajás, protesting at the government’s delay in settling families on the lands of the Macaxeira plantation, which they had been occupying for several months. In the late afternoon, the commander of the military police of the state of Pará sent troops from two different barracks to the scene; they surrounded the protesters from both sides of the highway, immediately opening fire with rifles and machine guns. They killed nineteen peasants and left fifty-seven others wounded. The forensic pathologist Nelson Massini, a professor at the Federal University of Rio de Janeiro, sent to the Forensic Medicine Institute of the city of Marabá by the Senate Human Rights Committee, confirmed that at least ten of the victims were summarily executed by bullets in the head and the back of the neck. Judging from the powder burns, the weapons were discharged at extremely close range. Seven other bodies were hacked to pieces by blows from a scythe or large knife. Pará, 1996. 'Carajás is a region located in the southeast of Pará. It got its name from the Carajás hills, where formerly the indigenous people of that name lived; the regional center is the city of Marabá. 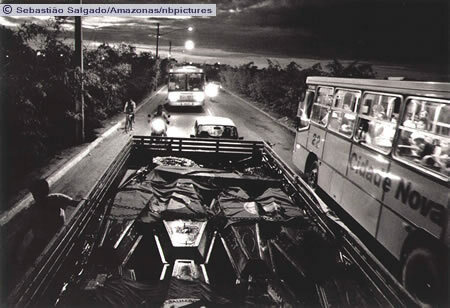 In the municipality of Paraupebas, a massacre of 19 Sem Terra people took place, perpetrated by the state police and the landowners, on April 17, 1996, during a demonstration on the local highway. In March, 1998, eight of the same policemen were involved in the murder of two more MST leaders of the region’ (Fernandes, Bernardo Man�ano e Stedile, Jo�o Pedro. Brava gente: a trajet�ria do MST e a luta pela terra no Brasil. S�o Paulo: Editora Funda��o Perseu Abramo, 1999, p. 144, n. 13).